I like all things pickled. 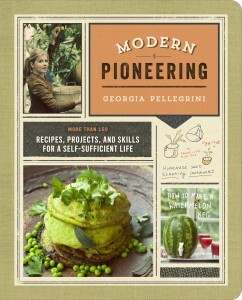 Pickled peppers, pickled ramps, pickled… things. Sorry. I’m not feeling very eloquent today. I just read a lot of legal jargon and it fried my brain and my eyes are blurry. I can barely see this screen. I’m waiting for things to return to normal… which isn’t necessarily eloquent either, but at least there’s a sliver of a chance. I had fried pickles the other day. If you ever find yourself near a fried pickle I’m warning you now, that moderation isn’t an option. So if you don’t want to eat one hundred of them, don’t even eat one. Consider yourself warned by yours truly. 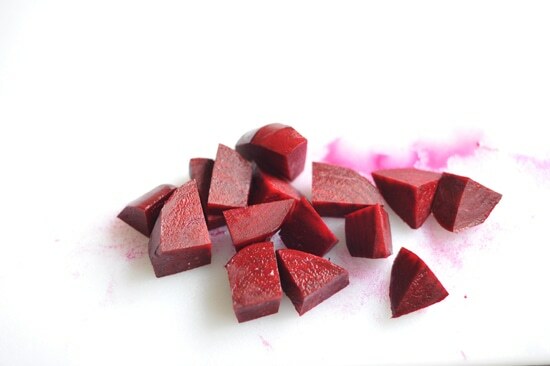 Peel and chop a red beet into small pieces. Cook the pieces in water, covered, until fork tender. 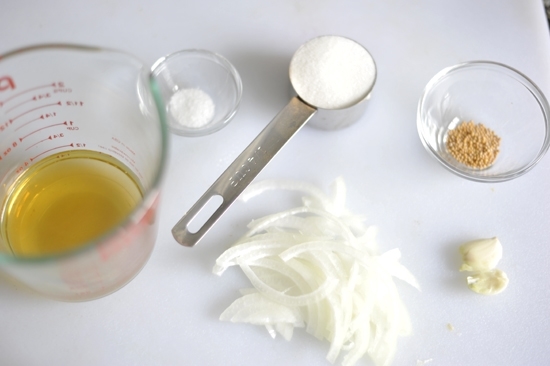 Meanwhile, gather your pickling ingredients: crushed garlic, sliced onions, cider vinegar, sugar, salt, mustard seed. 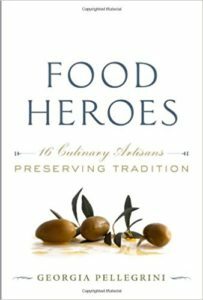 As you know I encourage experimentation with your ingredients so swap things in here for other flavors that suit your fancy. 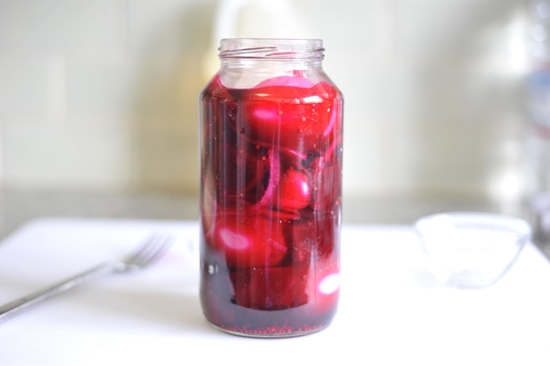 When your beets are fork tender you are going to place them in a glass jar along with some hard boiled eggs…. Like so… then you’ll alternate with your onions, more beets, and more eggs. 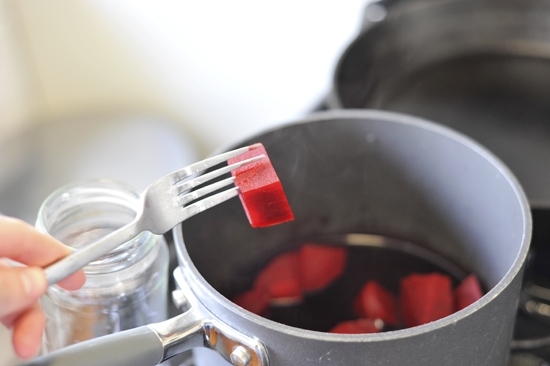 Meanwhile, you’ll add the pickling ingredients to your beet cooking liquid and bring it up to a simmer. Give it a quick stir and make sure the sugar and salt are dissolved. Then you can add them to a salad for a little intrigue. Because let’s be honest, some days you need a little intrigue. Drain the beets, reserving the liquid. There should be 1 cup of liquid left. If too much has evaporated simply add water. 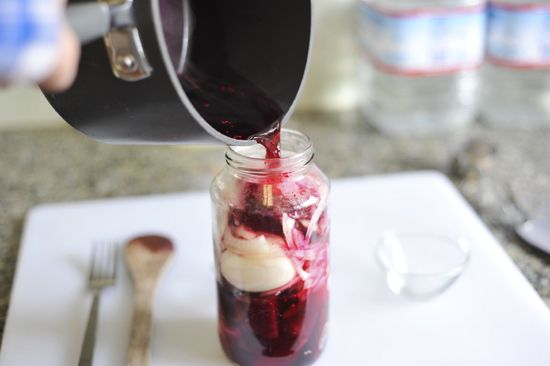 Put the eggs, beets, and onion in 1 large jar. 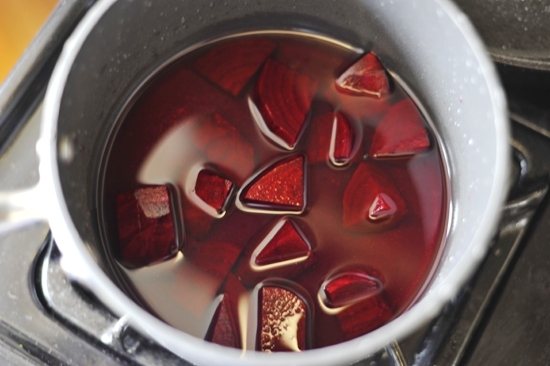 Combine the beet liquid, vinegars, sugar, and salt in a small saucepan, bring to a boil, and simmer for 3-4 minutes to dissolve the sugar completely. Pour the hot brine over the contents of the jar to cover. Cool to room temperature and seal the jar and refrigerate for at least 1 week before serving. 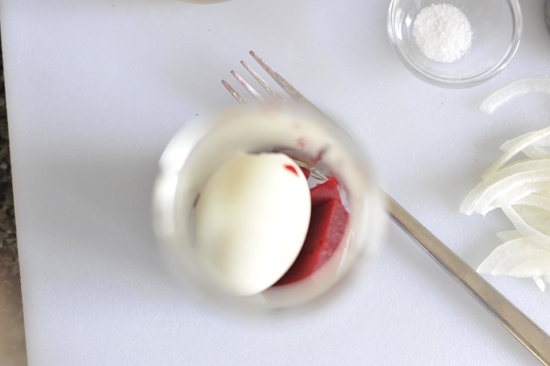 *Tip 1: For perfect hard boiled eggs, place them in a pot of cold water and bring the water to a boil. Once the water begins to boil reduce the heat to a simmer and time 8-10 minutes more. Remove from the heat and run under cold water until they’re room temperature. 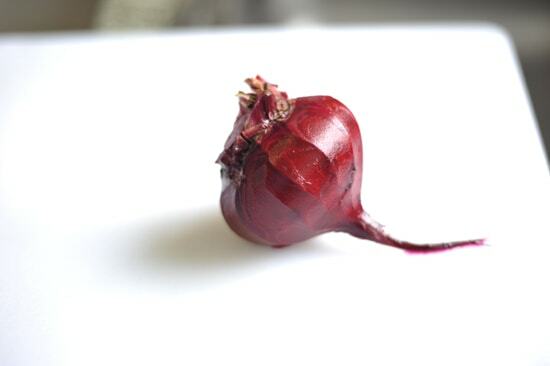 **Tip 2: To cook the beets, peel them and quarter them. If the beet is large cut it into eighths. 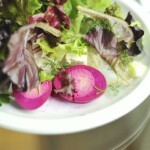 Place them in a small pot and add water two inches above the beets. Cover and simmer until fork tender. I LOVE this! Salad intrigue is exactly right. 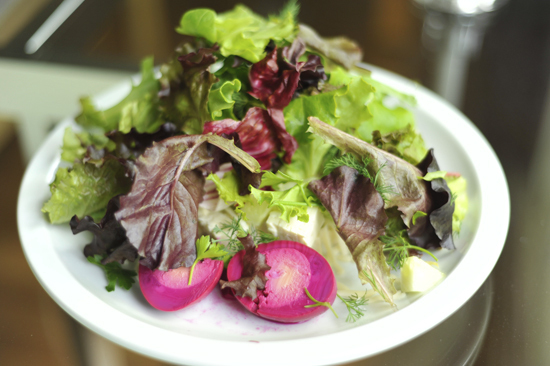 The beets and onions end up being useful too for a salad! 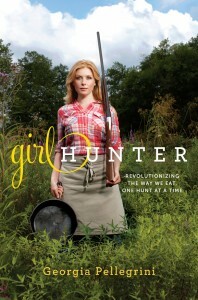 I just found your site through Tasty Kitchen and I'm loving it! I totally agree, fried pickles are addicting. There's a secret about them too: the Sonic will make them for you but they are not on the menu. I hope you live in a place with a Sonic drive-in. Wow, why haven't we met sooner?! I think we're long lost friends! What a fabulous looking specimen! So beautiful! I would love to share this if I may on my web site!